The First Sunday in Lent (March 5th, 2017) – Rev. Canon Dr. William J. Danaher Jr.
And it always stumped me, they never asked any follow-up questions. Like, “Are you a good professor?” Or, “What are the ethics you’re teaching in this university?” They just assumed that I was doing good work. But when I would say that I was a priest, there was always this incredible awkward moment. There’d be a little bit of silence, and they would take the measure of me. Sometimes they would say, “Really?” And I’d say, “Really.” And I suppose that’s because when you announce yourself as a priest, you immediately close distance, and you create a different kind of space. And in that space, there’s been a lot of wonderful things for people, but there’s also been a lot of heartbreak. And there’s a lot of disaffection. There’s things that we do that mean meeting a priest to be the kind of challenge that it can be. Sometimes I wonder if they go back in their mind, and they think, “What have I done in this conversation? Have I said anything bad? Have I sworn, or anything like that?” What does it mean to be a priest? Well, one of the things that I’ve learned over the time that I’ve been in this bi-vocational moment, is that the more that I can lean with the priesthood, is the more I get the invitation to be part of some magic. That is to say, when I am presenting as a professor, or when I did present as a professor, I stayed within my comfort zone, and I was well armed. I had my academic armor on, my institutional affiliation. But when I would actually speak about being a priest, and become present to that person as a priest, I found myself entering vulnerable space. And I had to take off the armor that I was wearing, and stand before them as a person bearing witness. As an imperfect person called by God, and hoping somehow to create holiness in this world around us. Over the past two-and-a-half years, I have had to lean more and more into that role of introducing myself as a priest. And many people like to talk about how difficult it is. And it is difficult. And many people note that you have to balance all of the different beliefs, and opinions that people have, their desires, their hopes and dreams. You have to be present to people at incredible points in their own lives. And you have to stay true to what you think God is calling you to do in the midst of leading a surprisingly complex organization. But one of the things that I think I don’t speak enough about, and I think we should speak more about, is how incredibly beautiful this calling is. And I say this not to draw attention to the fact that I’m a priest, and you’re not. But actually, call attention to the amazing part of what it means to be a priest, which is to be a public Christian. To act on behalf of the Body of Christ. So the beauty of my calling is in some sense a reflection of the beauty of your calling as Christians. Of all that you are called to be as Christians. And over the past week in particular, I’ve had these incredible moments in which I have been witnessed the most beautiful things. Some of these have been incredibly heart breaking. On Tuesday morning of this week, Pastor Manisha and I went to meet relatives of relatives of people connected to the church who had lost their son suddenly, and unexpectedly. And we walked into Desmond’s Funeral Home, and this family just came to us, and wept. And we blessed the body of their son. And as difficult as that was, the connection and the vulnerability, and the beauty of it, the presence of God that was somehow there in the midst of that incredible suffering, was so palpable you could touch it. And then on Tuesday night, we had our Shrove Tuesday Mardi Gras party, and I was dancing up a storm. And in the midst of that exuberance, there was this incredible connection between the congregation, as people young and old got up on a stage and acted the fool, in the classic sense of that. And raised up everybody’s spirits and happiness. And then Ash Wednesday, we began with the ashes that we had taken and burned on the Tuesday before. And we made ashes, and we put them on people’s heads and we said to them, “Dust you are, and to dust you shall return.” And we not only did it here, but Pastor Joyce and I went to Oakland County Jail. And we walked into this incredible space, where 30 inmates had gathered. And then, as soon as I walked into that space, I recognized that they were not there under duress, they were not there in a cynical way. They were there because they knew they had to make changes. And I felt called to say things that I never would feel called to say as a professor, but only as a priest. I said to them that the ashes that they were about to have on their forehead would be the same ashes on everybody’s forehead in our church. And that they were, in a sense, an extension of us. And that they were, in a sense, members of Christ Church Cranbrook in this way, spiritually. And that God loved them, and that God was reconciling them today, and had already reconciled them through Jesus Christ. And I said to them that I was the tomorrow to their today, and that their today would have a tomorrow. And that this service of Ash Wednesday, in which we admit that we are all going to die, and that we are all limited and sinful, is a moment for us to reach out for Jesus, who has the power to turn death into life, and sin into reconciliation; who has the power to forgive and to heal us, and to put us right with God, and each other. I could never have said that as a professor. I would have never entered that space, had I remained cloaked in the armor of academics. I simply had to go in, and step into that vulnerable space, and give the promises of God. And then, later in the same day, we sat down with Diane McDonald’s family to plan her funeral. She died on Tuesday. And Diane gave one bit of information, one request regarding what she wanted for her service. She said, “Find Kate Bublitz, who I used to sing next to in the choir, and ask her. She will pick all the music. She knows what I like.” And that to me was another testimony to the connection that you have in Christ, to the power of Jesus in this community. To the friendship that is built up when God is placed at the center of our lives. So truly, I have a beautiful life. I have an incredible calling. I have been extraordinarily blessed, and I am incredibly fortunate to be here, and there is not a day when I’m not humbled to be here. And I know that I do that because I walk across bridges, so many of you built. The connection to the family that was mourning the loss of their son. The ministry that happens in the jail was done by parishioners of Christ Church Cranbrook. All of this is a blessing. And all of this has been something that I have had to give up in order to receive. And I’m so glad that I gave up what I had to give up to be here. Now all of this is, in some ways, an extended example, I think, of what is going on in today’s reading from the Gospel of Matthew. Because Jesus is being challenged after his baptism to step into a place, and to become vulnerable so that He could be prepared to minister in the name of His kingdom. And this temptation in the wilderness, in which He steps away and fasts 40 days and 40 nights; that is entering a vulnerable space, so that He can know that God is with Him. And with that space comes temptation. Jesus recreates, just as Moses went up on the mountain and fasted 40 days and 40 nights before receiving the law. Jesus puts Himself into a place, in which He fasts, and puts Himself ready to receive a revelation, as it were. And Jesus is tempted. And people like to speak a lot about the nature of those temptations for material well-being in the form of bread to someone who is hungry. For safety in terms of being able to cast Himself off the top of the temple, and to be cradled by angels. And for power and authority, if only He would worship the devil, and betray Himself. People like to talk about those temptations, but what I think they sometimes miss is the fact that when Jesus, the Son of God, went through that period of temptation, and made that decision to remain true to Himself, that He hallowed, and made holy all of the temptations we face in our lives. 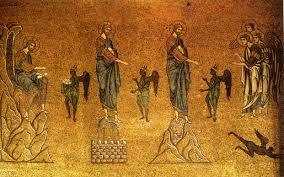 And the piece of art I’ve given you today is from the Basilica of St. Mark in Venice, Italy. And you see here that testimony that Jesus remains Himself in this incredible little panoply you have of Satan holding up these perfect little stones to be made into bread. They look like buns in the making. And you’ll see this at all of the different iconography of the temptation of Christ in the wilderness in Europe. And you see Jesus on the top of the temple, and Satan bidding Himself to throw Himself down. And you see Jesus on the mountain being offered the whole world, if He would simply betray himself, and worship Satan. And finally, you see Satan vanquished, and the angels coming to minister to Him. And what’s important, I think, about this piece, because it is so beautiful, is the fact that Jesus stays the same in each of these pictures. The temptations change, but Jesus stays the same. And the promise to you and me is that we can stay the same and become more of who God has called us to be to the extent that we let go of those things that are not bringing us the peace, and love and joy, and beauty that God is calling us to be. That the extent to which we can let go of the things that tempt us, that do us no good, is the extent to which we can receive the incredible blessing of God. And to let go of those temptations means sometimes entering into very vulnerable space. But it’s precisely in that vulnerable space that God’s revelation becomes more powerful than it otherwise might be. Finally, Jesus goes into this space, and encounters it because He wants to, in some ways, preach the grace of God itself, through Jesus Christ. And He defeats Satan, not by exercising superior firepower, but by simply holding on to the word of God. And so you see in each of those little pictures, Jesus has a scroll, and this demonstrates to us, not only the grace of God in Christ, but how we, as limited, fragile, finite human beings, as fallible people can make it through all of the temptations of our life, and remain true to our self. True to our God. All of this stands at the beginning of Lent. Lent is not a time of self-denial. It’s a time of self-affirmation. It’s a time of self-actualization. It’s a time of reclaiming your identity. It’s a time of opening up yourself to God’s revelation in the midst of becoming vulnerable before God. It’s an opportunity for us to begin again. To rebuild bridges. To forgive others, and to be forgiven. All of this we face from the inside out, as we look in, in order to look out, and to be transformed by God’s presence inside of us through Christ. This Lent, what do you need to let go of? What identity do you need to reassert? What is the beauty that God is calling to you to, to be and embrace? What is the love that draws you out? What is the life that you’re seeking? How will you encounter magic? These are the questions you and I have to struggle with, as we walk with Jesus on His way to cross and resurrection. Amen.